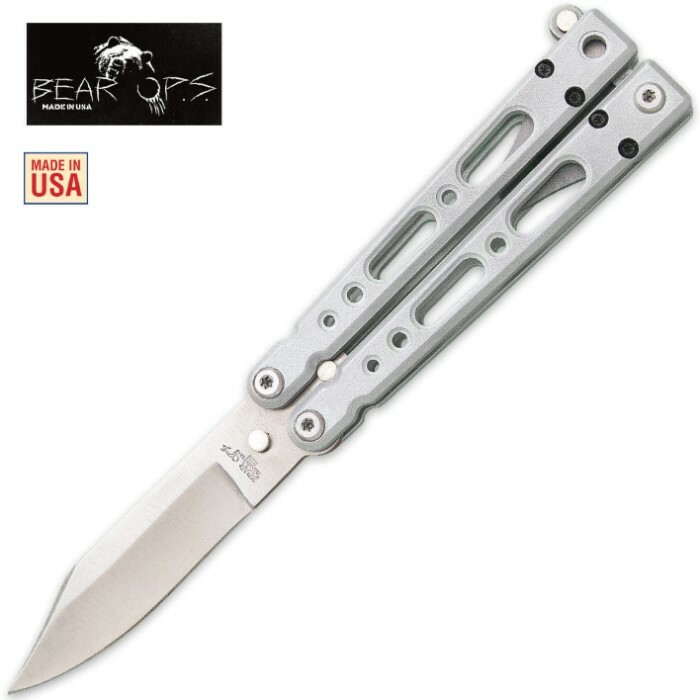 Bear Ops Bear Song IV 450 Butterfly Knife Silver | BUDK.com - Knives & Swords At The Lowest Prices! The butterfly knife experts at Bear Ops have created one of the best performing balisong knives on the market. This Bear Song IV features a premium 14C28N stainless steel blade that is honed to razor's edge. Silver T6 aircraft aluminum handles reduce weight and the blade opens smoothly on the bronze phosphorous washers. This is a nice sturdy knife with a smooth action. It will be a lot of fun to learn how to do tricks with it. My only criticism is that the clasp is too loose and flops around. An o-ring should take care of that very nicely. Otherwise it compares favorably with a knife at twice the price.